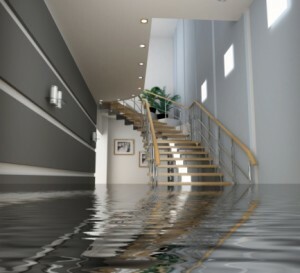 When most people imagine their basement getting flooded, they think of occasional natural disasters or heavy rains and storms during the fall and spring. Unfortunately, basements can get flooded in winter too. Despite the colder temperatures that turn rain into snow, poor maintenance over the summer and shifting weather can lead to cracks in your foundation or burst pipes that can send water into your home. Here are the most common causes of basement flooding and how you can protect your home. Rainy season is over, so many homeowners feel a sense of security in believing their home is no longer at risk of flooding. Unfortunately, this is not the case. Piles of snow can still melt around your home’s foundation to cause seepage to enter your home. Gutters clogged with ice or full of snow can melt and lead to unexpected amounts of water to pool around your house. Seasonal water issues can usually be managed with good maintenance, so it is still strongly recommended to check around your home during winter. Pipes and other parts of your storm sewer system that receive and carry away storm water can get clogged with debris from fallen leaves, garbage, and other materials. When this happens backups can occur. You might be able to visibly notice a plugged storm drain, but sometimes the flooding has already happened before you can resolve the situation. It is usually not recommended to clean these drains on your own, as the city is typically responsible for these systems. However, if you see a drain blocked by a large rock, branch, piece of trash, or other obstacle in dry weather, you can clear it away. Debris such as leaves, twigs, seed pods, and garbage in your downspouts, gutter, or eavestroughs will block water from being diverted away from your home. Clogged gutters can cause basement flooding when they impede water from running off your roof. Overflows can cause water to flow down the side of your home and seep around the foundation. When working and installed correctly, downspouts are designed to direct water away from your home and its foundation. They should be at least five or six feet away from your basement wall, and drain away from your home towards the street or your backyard. Damaged downspouts will cause water to pool beside your house. As it softens the soil around your home, water can begin to leak into your basement through cracks in the foundation. When initially consyructing a home, the basement tiles and foundation should be sealed properly, but if they are not sealed correctly, water will seep into the basement over time. If you’ve already noticed water on your basement walls or floor during rainstorms, this may be the cause. It can be alarming and frustrating when your local or regional utility has experienced a failure that will affect your water supply and drainage. Although you cannot predict these causes of floods, you may have enough time to move your belongings to higher ground to prevent them from getting soaked in water. Ideal home construction places buildings on a gentle mound that grades downward by six inches within the first 10 feet away from the house. Unfortunately, some houses are not placed this way, which can lead to water sliding down around your home’s foundation. You can’t simply pick up your home and move it elsewhere, but flood damage restoration companies can help block the cracks and create a better seal to prevent water from seeping in. If you live in an area where there is lots of water, it’s likely your home was built with a sump pump in the basement flood. These pumps work 24/7 to move water out and keep it away from your basement, but like all equipment, they can fail or break without regular inspection, maintenance and repair. If this sump pump fails, there is usually a backup sump pump to work in its place, but if this also fails you can expect to see water rising from your floor. Your appliances need to be monitored and maintained on a routine basis to help them work their best. If your water heater has clogged or is leaking due to poor maintenance and inspection, this can be another source of water damage. The best defense against flooding in your basement is prevention. You can do a visual inspection by checking the grade of your yard around your home. Make sure it slopes away from your house, and regularly clean and maintain your gutters and the ground around your house. Inspect your foundation for cracks and ensure to tightly seal your basement windows during rain and snow storms. Although you can prevent basement flooding by taking precautions, sometimes some issues cannot be seen by the untrained eye. Flood damage prevention and restoration professionals can help you inspect the source of water damage and mitigate it to get your home back to normal. If you need help with water damage cleanup in Toronto, Flood Services Canada can help. Our professionals can provide you with a variety of solutions, and we can help you settle with your insurance company to get your life back to normal as soon as possible. We deploy our quick-response teams across the GTA to help homeowners save their property in emergency situations. We provide 24/7 sewage, water damage, and flood cleanup services and will use the best techniques, personnel, and equipment to ensure your home is clean, safe, and dry as soon as possible. Contact us at (416) 302-2107 to learn more about our services, or use our emergency hotline at (416) 999-3930 to get our rapid-response teams deployed to your location.